Have you ever looked at the pipes below your sink? I'm sure you were able to notice a small valve attached to some parts of the pipe line. This is what we call "shutoff valves". 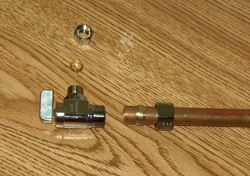 Shutoff valves are usually chrome in color. This type of valve is most suited to help home owners not just to control the water flow in their entire house, but also to save more money on water bills. A lot of old houses has these installed on their pipes, enabling them to control individual tap. There are lots of home owners who were able to fix and install these types of valves in their home, because they prefer doing it by themselves, however there are some precautions that needed to be aware of especially if you forcefully turned the valve it will cause the pipeline to break. Sinclair Plumbing professionals still are the best choice to help you with this kind of issues.